Shangri-La is one of the remastered maps included in the Zombies Chronicles DLC pack for Black Ops 3. Dating back to the Black Ops 1 era, the Shangri-La Easter Egg was one of the first extensively difficult EE's to solve. In this guide you'll find a complete step by step guide, composed in the usual indepth style with screenshots along the way. Long time Treyarch fans will remember that Shangri-La appeared in the second half of the DLC season for Black Ops 1, launching on July 28th 2011, at a time when Xbox had the timed exclusive contract! 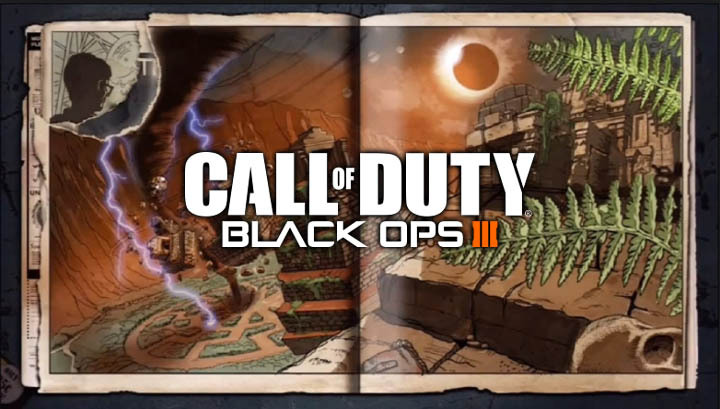 The map appeared directly after Call of the Dead but preceded the now infamous Moon map, which is also included in Zombie Chronicles. 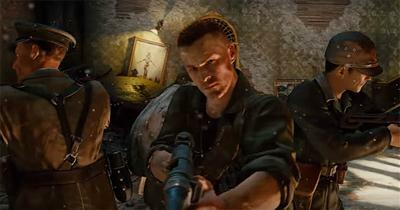 The original four characters, Richtofen, Takeo, Dempsey and Nikolai appear as the playable characters and the story closely follows the main events leading up to the nuking of earth. This is of course the remastered version of the map and the lush jungle scenery, mine tunnels and waterfalls have been delightfully improved. Shangri-La includes one of the games more unusual Wonder Weapons in the shape of the 31-79 JGb215, a shrinking device that turns zombies into miniature versions that you can crush as they try and scamper away. The official name of this Easter Egg is "Time Travel Will Tell". "Time Travel Will Tell" is the longest Easter Egg in Black Ops 1 and was for a long time one of Treyarch's hardest puzzles to solve. It took many hours for the community to work out how to get the dynamite and complete the final steps for the Focusing Stone. The Easter Egg requires four players to be present in the game and is NOT possible SOLO - simply because the Eclipse mode requires four buttons to be pressed simultaneously. You will need a couple of important weapons including the upgraded shrink gun and trip mines (originally spikemores in BLOPS). Team communication is also an essential element with many steps requiring simultaneous sequences such as standing on matching stones. The first step of the Easter Egg is a simple one. Open up enough doors to work your way through the mine tunnels to the water wheel and the power switches on the wall. Flick the wall switch to turn on the water and activate the power. Secondly, take a moment to open the Pack-a-Punch machine which resides at the top of the stairs leading towards the temple from spawn. To do this, simply get all players to stand on the pressure plates (square stones) around the map. They are always beside the rotating animal statues. In the spawn area, near the Quick Revive machine, there are four circular buttons on the walls surrounding the Quick Revive machine. They look like ancient panels with a skull symbol on the front. Each of the four players must stand next to a button and then all four must press their button at the same time. This step has to be very well timed so communicate with the rest of the team using the countdown method 3, 2, 1 to get it spot on. Confirmation that the buttons were pressed correctly can be heard by a teleporter sound and then dialogue from Richtofen. He comments that an eclipse is occurring in the sky and that a giant meteor has appeared above the temple. You can see both of these objects in the sky for yourself, the eclipse is very apparent and the meteor is a huge red and black ball floating above the temple. Remember the simple steps for starting an eclipse mode because you will need to enter that mode on several occasions later. From spawn, take the pathway leads down to the minecart and tunnel entrance (not the mud room / waterfall side). There is another circular button on the stone wall here, just like the one you pressed before (see image above), It's precise location is near the perk machine opposite the tunnel entrance. Press the skull button and slabs on the floor in the nearby area will light up with particular white/blue symbols. The symbols vary on each slab but can include diamond, circle, half moon, triangle, 3 dots, circles intersecting etc. The key to solving this step is to have one player stand on a stone and another player to stand on the same symbol on a different slab, essentially matching up the two slabs. In total there are 12 slabs near the tunnel entrance and another 12 on the other side of the map. The player near to the tunnel entrance (who pressed the button) has slabs in quick succession nearby the perk machine and so this person should be the caller. Successfully completing this step will play additional audio dialogue from an unknown group of explorers who need your help. They mention a secret passageway below ground. Turn on Eclipse mode by pressing the four buttons in spawn. Next, send three team mates to the bottom of the waterfall slide and get them to stand on the metal grates (see image above). Now send the fourth player down the water slide so they hit the grates with enough force to free the explorers. The explorer characters will confirm that "the way is clear" following a teleporter audio effect. A second Golden Rod will appear around the side of the temple, visible from the spawn area. For this step you'll need the shrinking Wonder Weapon. It's a box weapon (no parts or crafting in Black Ops 1) so repeatedly pull from the mystery box until you have it. Now go to the entrance to the water slide (mud room side from spawn) and look above at the cliff edge (see image above), There is a grey stone ball, perched up above. Use a weapon to shoot the ball down and watch as it falls to the ground. Now use the shrink weapon to shrink the ball to a smaller size, then push it (melee) into the water slide. Jump in after it and watch as it slides down into the tunnel. The ball eventually rolls onto the circular water shoot. Stand on the water shoot yourself and fly up into the air and back to the outside temple area. A short dialogue sequence plays and the eclipse passes, returning the environment back to daylight. An additional Golden Rod appears around the perimeter, taking the total to 3 rods. Start another eclipse event by having all four players press the circular buttons in the spawn area around Quick Revive. Head into the mine tunnel (mine cart side from spawn) and look for the valve wheel, which is tight up against the mine tunnel wall (see image). There is a mine shaft hole in the ceiling of this tunnel which is where the explorers are trapped. Interact with the valve wheel to turn it several times until a new audio quote commences. The explorer will comment that "he will thank you in person" before panicking and saying "the walls are moving, can you find a way to stop this before we are crushed!?". Shangri-La has two types of BOSS zombies: Napalm and Shrieker zombies. The former explodes on death whilst the Shrieker expels shock waves that disorient you. Make sure the eclipse event is active by pressing the four buttons if necessary. Now lure a Napalm zombie down into the mine tunnel to the room where the perk machine and weapon box location is. Lure him around the vicinity of the room so he lights each of the gas leaks (x 4) that are coming from the pipes, a small flame will appear from the pipe to signify that a pipe is successfully lit. There are two pipes in the tunnel and another two pipes in the perk room vicinity. Return to the valve wheel and pull the lever next to the valve. Another audio quote from the explorers will commence. Now the explorers are trapped in the waterfall area. You need to divert all of the water by plugging the gaps in the brick wall so the water doesn't escape through. For this step you'll need the trip mines (previously Spikemore mines in BLOPS) which are proximity explosive traps. They can be bought from the wall. Go into the mine tunnels near to the waterfall and place the trip mines strategically at regular intervals along the tunnel (where the flame torches are on the walls). They must be placed at four spots, each one opposite the circular holes in the tunnel wall. Lure zombies into the trip mines causing them to explode and watch as the shrapnel plugs the gaps in the tunnel wall. Once all the holes are plugged, press the button at the bottom of the waterfall which causes the water to flow at double its intensity and listen carefully for the teleporter sound to confirm this step was done correctly. Activate the Eclipse mode again. After freeing the explorers from the waterfall, a series of stones with symbols on them appear around the map. Similar in appearance to the stone slabs from earlier, these stones are not on the floor but rather on the side of walls. Go to the outside hut (mine cart side of the map) and explode the wooden trap to the left of the hut (outside the bounds of the map) using any explosive e.g. grenade, monkey bombs etc. There are a number of radios in Shangri-La but one in particular reveals a code that you must enter using the ancient dials. You don't need to find this radio because the code is always the same and is shown below. Simply locate the four huge golden dials in the mud room (shown above) and interact to turn the dial's position. So if a dial position has the symbols C and two dots then the number is 12. The number 16 has a C, an I and one dot. At this stage you will have 6 Golden Rods (orbs) in the spawn area. Again, ensure that you are in Eclipse mode for this. Around the map there are 8 gongs that you can melee. Four of the gongs will make a continuous tone sound and you must hit the exact four in sequence. If you choose a wrong gong in the sequence the tone stops, the orbs turn red and the puzzle restarts. Whilst the fourth gong is still ringing, head to the temple area and shoot the orbs (on top of the Golden Rods) with the upgraded shrink gun. Dynamite will drop and appear in your inventory. Finally, shoot the orb (shown in image above) to deflect the light at the meteor, causing it to shrink and disappear. Go back to the spawn area and note that the Pack-a-Punch machine has disappeared. Activate the PaP pressure plates and climb to the top of the stairs leading to the large temple. Stand by the wall and listen to the explorers talking. Give them the dynamite and they will escape by exploding the wall in the past. The present version of the map alters to show the wall has been destroyed. Activate Pack-a-Punch once more and head back to the top of the stairs leading to the temple. The shrunk version of the Meteor is spinning just inside the room where the explorers were trapped. Pick up the stone and listen carefully to the character dialogue. Congratulations you have now completed the "Time Travel Will Tell" Easter Egg for Shangri-La. As a special reward you gain ALL 7 perks and even if you go down you still keep all the perks indefinitely! !